Pattern for a 31″ x 31″ quilt or wall hanging. 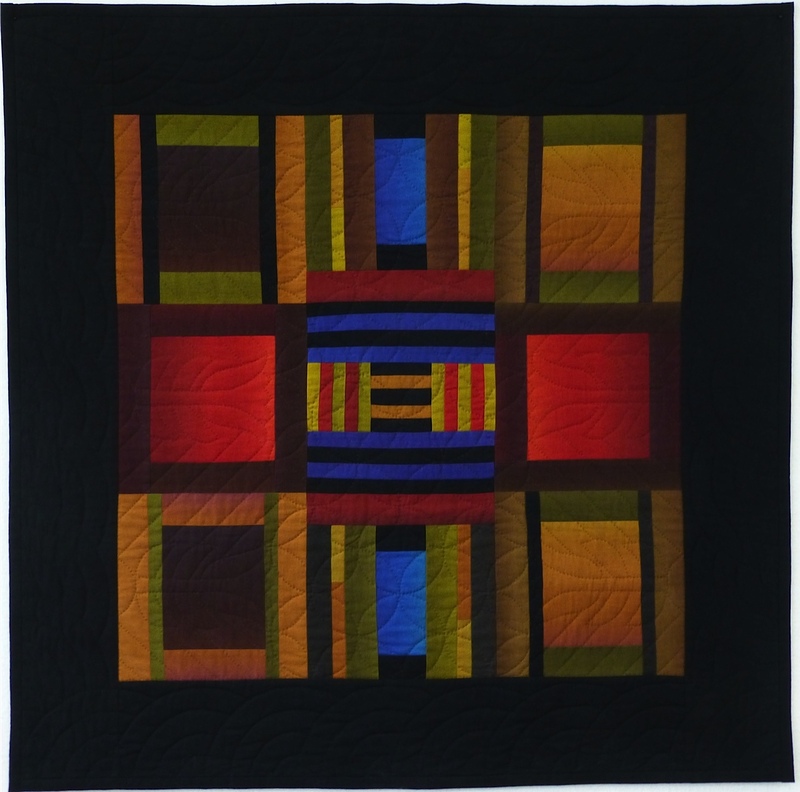 Instructions are included for 3 methods to construct this quilt: Modern, Historical and Paper Foundation. 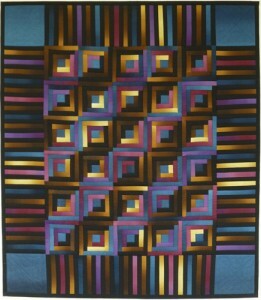 This quilt was inspired by an antique crib quilt in the collection of the Illinois State Museum. The antique quilt was made about 1898 by Elizabeth Briskey Mast. The antique quilt is pictured on page 56 of the book, Illinois Amish Quilts: Sharing Threads of Tradition, by Janice Tauer Wass. (Springfield, IL: Illinois State Museum, 2004). While the antique quilt used a variety of solid-color fabrics, the same effect can be achieved with Caryl Bryer-Fallert’s Gradations line of fabrics produced by Benartex. The fabrics used are half yards of: #90 Earthy Spectrum, #38 Rainbow Autumn Spectrum and #78 Chocolate and 1 yard of solid black. Pattern for a 36” x 43” wall hanging uses two fabrics from Caryl Bryer Fallert’s Gradations Line by Benartex—1 1/3 yards of the border fabric and 1 yard of the setting squares fabric. Pattern includes instructions for rotary cutting to maximize the color variations of this fabric. 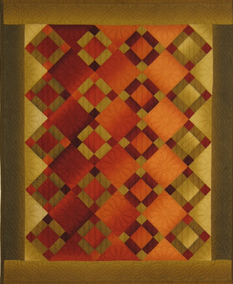 Shown in the rust and olive combination inspired by a bed-sized antique quilt made about 1870 by a quilter from the Amish community near Arthur, Illinois. Also shown in a more contemporary version using Fallert’s eggplant and yellow-green fabrics. By using the color variations in these fabrics you can create a visually sophisticated design by using just two fabrics of contrasting colors. Kit for wall hanging includes pattern and enough fabric for top and binding: $35. plus $10. for postage and handling. Please specify color: (1) rust and olive or (2) citrus and violet. If you bought a pattern that is marked copyright 2007, please make the following correction to step 4. From the approximately 5 1/2 ” wide strip of fabric remaining cut one 3″ wide strip for use in step 11 and cut one 1 3/4″ strip for use in step 9. Pattern for a 35” x 38” wall hanging uses two fabrics from Caryl Bryer Fallert’s Gradations Line by Benartex: 1 ½ yards of border fabric and 1 yard of stars fabric. 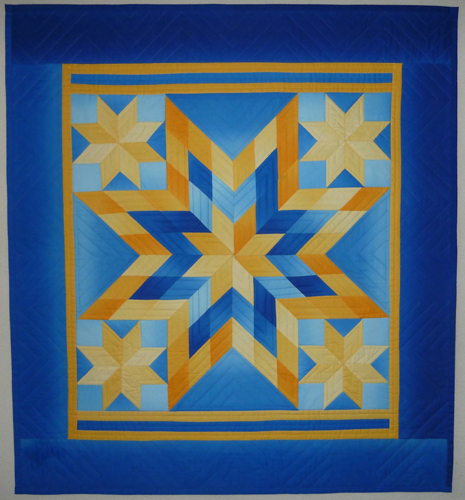 By using the color variations in these fabrics, you can simulate the blue and yellow colors of the Amish quilt that inspired this design. 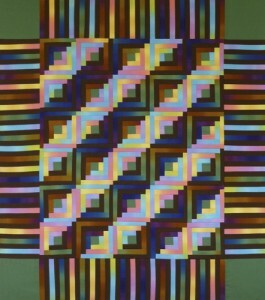 The original bed-sized quilt was made about 1950 by Sovilla Mast Schrock in Arthur, Illinois. It is pictured on page 123 of the book, Illinois Amish Quilts: Sharing Threads of Tradition, by Janice Tauer Wass (Springfield, IL: Illinois State Museum, 2004). 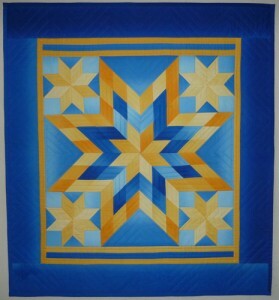 I used ultra blue #50 and corn cream #3 for my adaptation of this simple quilt. Instructions use strip piecing and fusible interfacing to control bias edges and for more accurate piecing of the 8 pointed stars. 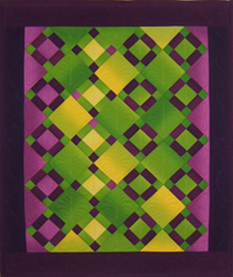 Pattern for a 38” x 44” crib quilt or wall hanging uses fabrics from Caryl Bryer Fallert’s Gradations Line by Benartex. 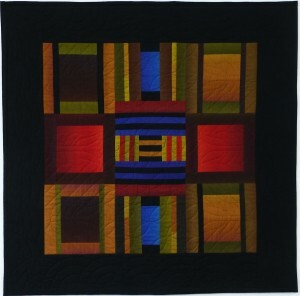 The antique crib quilt that inspired this design was made with black, blue-green, brown and purple fabrics. It was made about 1890, possibly by Lydia Yoder Diener in Arthur, IL. It is pictured on page 21 of the book, Illinois Amish Quilts: Sharing Threads of Tradition, by Janice Tauer Wass (Springfield, IL: Illinois State Museum, 2004). To simulate the variety of colors of the antique quilt, I used #84 aubergine/plum, #78 chocolate, #46 deep spruce, and a black solid, but you can experiment with your own color combinations. For a more contemporary approach, which I titled “Swing Seasons”, I used #72 pastel spectrum, #90 earthy spectrum, a solid brown and a medium green. You will enjoy playing with the colors of these Gradation fabrics as you sew your “logs” around a center square. Basic instructions for sewing the blocks are included.